People seem to be upset at those who are saying Happy Holidays instead of Merry Christmas. This is something that I have stayed away from, because in reality, there is more then one holiday celebrated at this time of year. So, it just makes sense to me to say Happy Holidays to some people. And I don't think that it makes me less "Christian" or less then serious about my holiday. 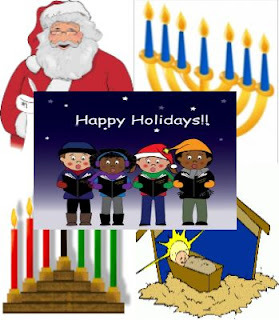 When someone wishes you a Happy Holidays, do you really think they are doing it to negate what you believe? The kids I am raising are learning about other holidays, they are learning about diversity and other religions, they are learning to respect others. How can I teach them respect if we don't acknowledge all these other religions? What about those around us who don't celebrate any holiday? Or those around us who have lost loved ones around this time, and don't find it to be a "Merry" season? In our house we will be saying Happy Holidays to those we don't know, or to those that we know celebrate something different. We will also be saying Merry Christmas to those closer to us, who we know celebrate Christmas. How do you feel about this? What will you be saying? I totally agree with you too! Who are we to think we have it all - it's "OUR" holiday. It's arrogance and I can't stand it when people PUSH and get angry when someone says Happy Holiday. I remember a Pastor's Wife friend of mine, she was working at GAP and said Happy Holidays to a patron. The customer YELLED at her that it was Christmas and that she's boycotting the GAP now. The time of day... just after church... the lady had just come from church... it spoke VERY loudly to others in the store - in the wrong way, if you know what I mean. That's not the LOVE Christ teaches us. I assess the situation and say what is appropriate to the party whom I am speaking with.